TORONTO, ON – Kensington Brewing Company has released a sneak peek of the can for its newest core brand which will soon be hitting retail shelves in Ontario. In 2011 our company was born in the back of a restaurant in Kensington Market. We had a simple desire to brew a pale ale that would pair perfectly with our house-ground burger. Our new can design is a nod to these roots and to our early food-first focus. It also pays homage to a neighbourhood synonymous with eating, drinking, and amazing food vendors. Working with Kensington Market-based design agency Pyramid Attack we collaborated on a new “store front” theme. The hand written window lettering and drop awning are two features that make a strong visual connection to our neighbourhood. 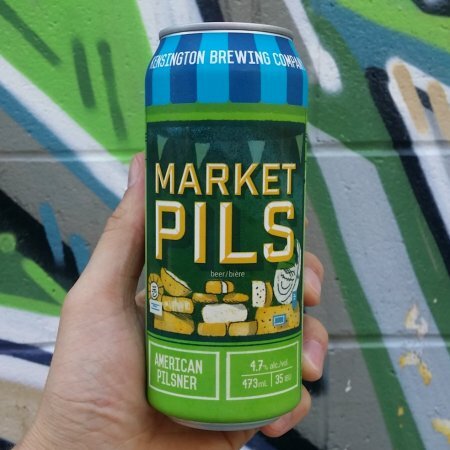 Market Pils will be available at select LCBO locations this autumn. It is the first beer in the Kensington line-up to feature the new “store front” branding style that will be extended to the rest of the brewery’s beers in coming months.